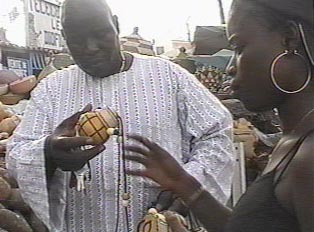 Before the age of twenty-five, many Senegalese tend to wear more western-style clothing, all of which can be purchased either at the malls or at individually owned shops. However, after women have begun to have children, and men begin to age, it is not uncommon to switch to traditional clothing. For this, one goes to the market, first to find the cloth vendor and then to visit the tailor that sets up next to the cloth merchants. A customer has measurements taken for the style of their choice and comes back at a designated time to pick up the outfit. Shoes are sold in a similar style. One can go to the malls or shops, but there are also both ready-made shoes at the open markets, and cobblers who, once a customer has bought leather, will make shoes to fit that person’s feet. In the open market, bartering is not only allowed but essential. However in the malls and shops, articles are tagged. It is not appropriate to barter in these situations, but it is still occasionally done. Electronic items, household goods, furniture and all other products are found in the various stores in the small malls and various city neighborhoods. There is not a highly concentrated shopping district in Dakar; rather, the stores are simply located where they have sprung up.